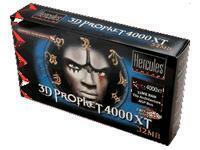 Effective, true, precise 3D graphic rendering is now available to all, thanks to the revolutionary 3D Prophet 4000XT. The 4000XT is designed to solve your graphic needs without creating a void in your bank account. The 4000XT creates lifelike images through its tile-based rendering process. This innovative 3D graphic rendering format reproduces only the visible aspects of an object, reducing the workload, but not the image quality.